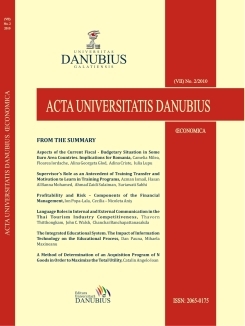 The Faculty of Economic Sciences of the “Danubius” University from Galaţi, Romania, has started publishing a scientific review: Acta Universitatis Danubius. Œconomica, since 2005, in English and French language, that is distributed both nationally and internationally and its main domain of study is economics. The theme of the review is very diverse. The scientific published articles encompass economic areas, from general economic theory, business administration, commerce, economic analysis, international economic relations to economic mathematics and informatics and history of economics. The review presents theoretical studies from all fields of economic activity, combining theoretical approaches with the presentation of practical cases, providing well documented answers to a wide range of issues encountered in the economic environment. The review represents the theoretical and empirical studies in economic areas and it is written by authors that are mainly from the academic world, but also researchers, master’s students, managers, entrepreneurs, business people, etc.